Do you want to measure distance between locations on Google Maps? This can be easily done using “Distance Measurement Tool” on Google Maps. 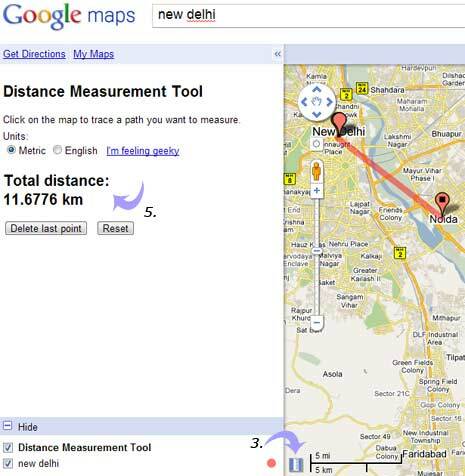 It allows you to calculate and measure distance between specified cities, towns or places marked on Google Maps. You can get final distance in desired unit of measurement like Kms, Miles and so on. 1. Open maps.google.com and click on Labs icon “new” at top right. 2. Then click to select ‘enable’ next to “Distance Measurement Tool” and click “Save Changes” button at the bottom. 3. You will see new ruler icon at bottom left of the map. Click ruler icon to highlight it. 4. Then click to select start and end position of two different places on Google Maps. 5. Total distance between selected pointed will be shown on left sidebar of Google Maps window. You can click “I’m feeling geeky’ link to select different distance format for displaying the calculated distance between two specific points on Google Map.